Imagine a typical day at the office. You are creating a financial asset portfolio, and more than just screening out the bottom decile of unsustainable assets you want to deliberately select those that are best in class sustainable. Would you assume that this fund, of let’s say – all green rated commercial buildings, will meet the minimum criteria set for other funds? Maybe not. You see, some operating savings like energy efficiency will not be returned to the building owner but rather will accrue to the occupant; so building owners might question why energy efficiency is a good investment. When rental prices don’t increase equivalent to energy savings then it may seem like it is more of a charitable ‘green’ strategy rather than a hardnosed business decision. The answer is, of course, because it helps lease the building and minimise vacancies, which is a very financially sound reason to put forward the initial investment. Naturally tenants who do the calculations see the benefit of lower energy costs and choose those office spaces first, increasing the occupancy rate of the building. All this isn’t very surprising really, considering how green is overtaking the commercial property market. (Kok) So let’s hope your answer would be, absolutely, I want all green accredited commercial buildings. Yet, are you really convinced? What about green stocks and what about green rated infrastructure; would those portfolios outperform others? Now, what about green infrastructure? Are you down with that? First of all, we need an identifier to show us which infrastructure is sustainable. Secondly we need a business case for financial benefits. The first part is covered by infrastructure sustainability rating schemes, in their various forms. However, building the business case is slightly more challenging, if only because the market is newer than green building rating schemes. Of the benefits[i] categories listed by Infrastructure Sustainability Council Australia (ISCA) (Stapledon) there are a few numbers that can give a ballpark figure for evaluation. Reputational benefits have been quantified a couple of different ways starting with figures from the 1980s and 1990s, showing massive benefits in stock value, devaluation during crisis and attributing the value of royalty payments. (Pickford) Although, you might agree that reputational benefits accrue to any sort of company, not just sustainable infrastructure. Certainly, weather risks are specifically important to infrastructure and insurance companies have readily quantified the costs. Weather-related losses and damage have risen from an annual average of about $50 billion in the 1980s to close to $200 billion over the last decade. (The World Bank) If you are in the business of infrastructure you don’t want to be paying through the nose each year for insurance premiums. For instance the MCC-funded road (Ranganathan) on Samar Island, which withstood Haiyan, one of the strongest typhoons in history, was a climate-proofed road that has shown its value[ii]. Lower operational costs (like insurance) will improve returns and lower downtime from emergency repairs and that improves the bottom line. Despite the field of financial metrics for sustainable infrastructure lagging somewhat behind green buildings, the rating schemes are very well aware of the need to create a business case. And they are not the only ones. Case in point, Global Infrastructure Basel is advertising as of January 2015 for an intern with this ambition: “The goal is to establish a sustainable infrastructure index and create investment vehicles for institutional investors.” If you aren’t already paying attention, then watch this space. One shouldn’t forget the other side of sustainable infrastructure. Urbanists have been documenting the effects of positive and negative urban infrastructure for many decades. 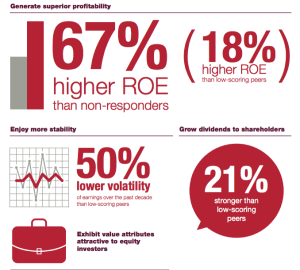 When unpacking the asset class into various categories, quantified benefits start to appear. Take transport as an example; Figures available range from economic loss due to traffic congestion, to the costs to society for obesity, respiratory and mental health. 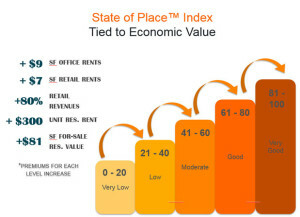 On the revenue side of the equation real estate values have been linked to walkability, and it has even been argued that consumers are willing to pay for a ‘sense of place’. One example of economic benefit from “place-based development” is the $273 million that Lancaster, California, saw from the revitalisation of its main street in 2010. 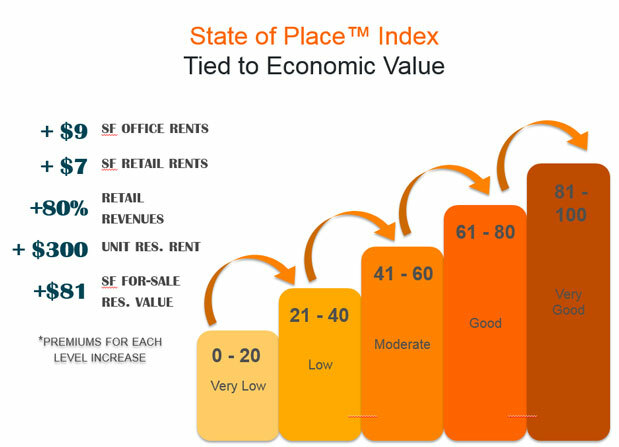 (Steuteville) Another example (see figure), the State of Place Index has put much effort in determining the real estate values of walkability that increase for each of its five category levels. Prosperous new cities will be those that know how to value and incorporate sustainable design. Perhaps you are now convinced that there is an upside to holding green buildings, businesses and infrastructure. The business case is getting stronger all the time, and screening in favour of these things will become more and more common. As the bar shifts it will become the new standard. “All of the funds have access to our sustainability rankings and take them into consideration in their decisions. In a few years, I would like to be able to say that all of our investment funds are managed according to those criteria” says Michael Schnieder, of Deutsche Bank’s responsible investment Asset Management. (Deutsche Bank) The day will come when no one will want to own the ‘brown’ buildings, stocks and infrastructure. Then those will increasingly be sold at a discount. These ‘non-green’ discounts have already earned the inglorious title of “the brown discount” in some circles. I know I don’t want to be the person left holding one. Alfonzo, By Mariela. “Making the Economic Case for More Walkability.” 8 5 2015. Urbanland The Magazine of the Urban Land Institute. 1 6 2015 <http://urbanland.uli.org/sustainability/houston-economic-case-walkability/>. CDP North America. “CDP S&P 500 Climate Change Report 2014.” 2014. Clarke, Anthony J. “Sustainable Innovation Diffusion in the Building Industry: Barriers and Potential Interventions.” Undergraduate Honors Thesis. May 24th, 2012. Dalkmann, Holger. “3 Promising Pathways to Finance Sustainable Cities.” 10 12 2014. World Resources Institute. 1 5 2015 <http://www.wri.org/blog/2014/12/3-promising-pathways-finance-sustainable-cities>. Deutsche Bank. “Sustainable and profitable – not a contradiction.” 13 1 2014. Deutsche Bank Responsibility. 1 5 2015 < https://www.db.com/cr/en/concrete-Sustainable-and-profitable-not-a-contradiction.htm>. Kok, Nils. “How green is overtaking the commercial property market.” 24 06 2014. Sustainable Property Research. 21 05 2015 <http://nilskok.typepad.com/nils-kok/2014/06/how-green-is-overtaking-the-commercial-property-market.html>. Pickford, James. Mastering Management 2.0: Your Single-Source Guide to Becoming a Master of Management . Financial Times/Prentice Hall, 2001. Ranganathan, Kumar. “MCC paves the way after Typhoon Haiyan.” 28 4 2014. Millenium Challenge Corporation. 1 5 2015 <https://www.mcc.gov/pages/povertyreductionblog/entry/mcc-philippines-is-paving-the-way-for-relief-after-typhoon-haiyan>. Stapledon, Tony. 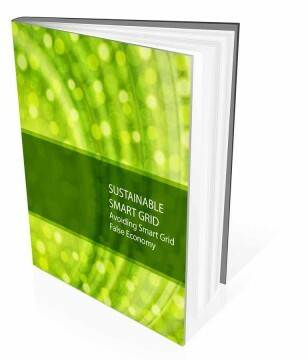 “Why Infrastructure Sustainability is Good for your Business.” 2012. Steuteville, Robert. “Why ‘place’ is the new American dream.” 1 08 2014. Better Cities & Towns. 1 05 2015 <http://bettercities.net/news-opinion/blogs/robert-steuteville/21230/why-place-new-american-dream>. The World Bank. “Weather-Related Loss & Damage Rising as Climate Warms.” 18 11 2013. The World Bank Working for a World Free of Poverty. 01 05 2015 <https://www.worldbank.org/en/news/feature/2013/11/18/disaster-climate-resilience-in-a-changing-world>. [ii] Some of the key climate-proofing measures included developing project-specific design criteria for drainage infrastructure and sea level variations, improving hydraulic capacity and embankment protection at bridges, improving drainage and culvert capacity to fit within the roadway corridor, roadway pavement and shoulder design to withstand flooding, improving closed drainage systems, and stabilizing slopes in mountainous areas.